There is a lot of confusion and a lot of myths as to what actually happens when you plug your caravan into the tow vehicle and start the engine. To really understand whats going on, we have to understand how the tow vehicle’s battery and alternator work first. It is then easy to see how connecting your caravan allows the engine to charge the caravan leisure battery. I’ve written this to try to remove some of the mystery (or should that be misery?) out of what happens when you plug your caravan into your tow car. A better understanding of what’s happening will hopefully help you fault-find if there are problems. “Oh no… it’s like school again“…. don’t panic! We do need to look back a few years though. Not too long ago, the only device to charge a car battery was a dynamo. It had fixed heavy magnets wrapped round a rotating coil that was driven by the engine usually via the fan belt. It wasn’t very efficient though. It was heavy, it has a commutator that allowed the rotating coil to pass the output current via carbon brushes which required some regular maintenance. The output of the dynamo went to a regulator that controlled the DC (Direct Current) voltage…. that eventually went to the battery. Dynamo’s typically had an output of around 25 to 30 Amps – which compared to modern alternators of around 120 to 160 amps was tiny. Dynamo’s were usually geared so that the turned twice as fast as the car engine, which was great when you average Ford engine only managed to do about 4500 RPM…. with car engines now revving up to 7000 RPM our poor old dynamo would be spinning at 14,000 RPM and lasting about a week as the centripetal force acting on those heavy copper coils rotating at that speed would pull them apart pretty quickly. Err… no you don’t. The old dynamo’s did need to have the engine going at a fast – 1800 to 2000 RPM idle speed to generate enough voltage to charge your battery but modern alternators will produce sufficient output to charge the vehicle battery at your engine normal tick over or idle speed. Why’s this? I hear you ask. Well, the old dynamo’s were rotating too slow at tick over or idle speed, the voltage was generated was around 9 or 10 volts… not enough to charge the battery, however at the higher end of the vehicles rev range, the output could be as high as 20 volts, so they had a box or regulator to control this excess voltage by switching the dynamo in or out of circuit. Car designers have to take into account that in winter you will start your car, turn on the heated windows and mirrors, heater fan, stereo, and then maybe leave the car idling to warm up. They have to ensure that even at tick-over, the output of the alternator is sufficient to put some charge back into the battery, power the engines electrical systems and power all the other things. If they didn’t do this, just leaving your car idling in winter could flatten your battery! Ok, lets skip a bit… vehicles are now fitted with alternators. These lightweight alternators are more efficient. For a start, they generate AC (Alternating Current) and don’t have heavy magnets. Instead of spinning a coil inside a magnet to produce electricity, they spin a magnet inside a coil, however, this magnet is actually a small ‘electro magnet’ (sometimes called the ‘rotor’) which is powered (or ‘excited’) from your battery. The current for these spinning coils is still fed through a commutator and carbon brushes, but as the current is so small, they generally don’t wear out. The coils wrapped on the outside of the rotating coils are called the stator – are the ones that actually produce the AC voltage. Obviously, we need DC to charge out battery and run the vehicles systems, so there are that is rectified using a bridge rectifier, which is made up of 6 diodes. There is a diode trio that powers the rotor windings…. but its starts to get a bit involved so we’ll leave it there. There are also brushless alternators… but that’s a different story. The output of the alternator is controlled by a regulator which may be mounted inside or on the back of the alternator (internally regulated), or sometimes on the firewall of the vehicle (externally regulated). This is more common on larger 4 x 4’s especially if they have twin battery systems. These regulators are nothing like the old dynamo regulators, they are solid state and they are a lot more sophisticated in operation. The regulator works by ‘simply’ increasing or decreasing the field current supplied to the rotor to control the output. If you have an alternator that can produce 120 amps (max) and the total current demand from the electrical accessories (including the battery) is only 20 amps, the alternator will only produce the necessary current (20 amps) to maintain the target voltage. This is determined by the voltage regulator and the resistance of the electrical load on the alternator. If the voltage starts to fall below the target voltage, the current increases allowing the voltage to remain the same. The full output of the alternator however is not usually available at your engines idle speed. The output power increases with RPM and maximum output is around 1800 to 2000 RPM. On newer vehicles now however, there is a move away from the alternator having its own or a separate regulator and the engines own ECU controls or regulates charging output so it can balance electrical load and engine efficiency. In some modern ‘eco’ cars, the ECU shuts down the alternator when the engine is at idle say at traffic lights. If the ECU detects a high load on the alternator… like on a winters morning you start the engine, turn the lights on, heated windows and car radio, then the ECU knows exactly how to alter the fuel going into the engine to make it as fuel-efficient as possible. Previously, the alternator would have just put a dynamic load onto the engine and the idle speed would have dropped, so the early engine controls would have just added more fuel to bring the idle speed back… prior to that, you might have even just pulled the choke out a bit to stop the engine running roughly and stop it from stalling. On some vehicles now, they have electric CAT pre heaters to get the catalytic converter up to its working temperature…. and while this is warming up, some cars don’t allow you to turn the heater blower fan on full or turn the heated windows or seats on. This is often a source of complains by owners that have bought these cars and are unaware of the system. So how does all that affect my caravan? Well…. remember the Dynamo? Way back then, it would have taken a week of running about to charge your caravan’s leisure battery, that’s why people took them home and sat them in their garage on a charger plugged in to the wall. When some of the first alternators came out, they still had a crude regulator and the output was a bit ‘iffy’ but it worked ok. The next leap forward was to be able to charge your caravan leisure battery while towing you caravan along the road. In the UK we looked at our 12N and thought…. “we need another plug” so we came up with the 12S…12 for 12 volts and S for ‘supplemental. (Yep you can get a 24N and 24S as used on commercial vehicles) However, our continental cousins looked at things and decided to adapt an existing 13 pin military plug and socket. This was great, we could now charge our leisure battery while driving at some ungodly hour in the morning just to beat the neighbours to the best pitch. However, the old dynamo dinosaurs warned “you will not charge your vehicle battery up unless you have a voltage controlled relay” Well, yes and no. Some of the larger 4 x 4’s just have a lead that goes from the battery via a 15 or 20 amp fuse straight to pin 9 (13 pin socket) or pin 4 (on the 12S) and have no other control. So when you plug your van in, there is a voltage from the tow vehicle present in the caravan all the time…. but we are getting ahead of ourselves here. Modern alternators and their regulators are quite sophisticated. The actual output voltage produced by the alternator will vary depending on temperature and load, but will typically be about 1-1/2 to 2 volts higher than battery voltage. At idle, most charging systems will produce 13.8 to 14.2 volts with no lights or accessories on. You can measure this by connecting the positive (+) and negative (-) test leads of a voltmeter to the battery terminals while the engine is running. When you first start your engine, the voltage should rise quickly to about two volts above the battery voltage, then remain steady. The exact charging voltage will vary according to the battery’s state of charge, the load on the vehicle’s electrical system, and temperature. The lower the temperature the higher the charging voltage, and conversely, a higher temperature requires a lower charging voltage. The “normal” charging voltage range is 13.9 to 15.1 volts at 25 deg C, but below 0 deg C the charging voltage might be 14.9 to 15.8 volts. Modern alternators are capable of 120 to 160 Amps output, which is more than enough for them to charge the vehicle battery, caravan leisure battery and run the fridge all at the same time and still have enough in reserve to power all the lights and car accessories. What happens when you plug your caravan into the towing vehicle? Well in Europe we have different regulations to the USA and Australia. We (in Europe) have to comply with a rule that basically says that only the road lights can be powered when we are travelling. This was done to make sure that nothing in the caravan could affect any of the safety systems in the tow vehicle, a side effect of this means we cannot use electric brakes on trailers which have been in use in the USA and Australia successfully for a number of years which allows a greater weight to be towed. It also casts some doubt on the status of some of the aftermarket brake assist and stability systems currently on the market…. these operate in a bit of a grey area currently. To stop anything being powered up in the caravan when the engine is running on the tow vehicle, there is a “habitation relay” which when it detects the engine running, it switches over and disconnects the caravan from the leisure battery and connects the car charging circuit to the leisure battery. This ensures anything in the caravan is disconnected. Remember when I said “Some of the larger 4 x 4’s just have a lead that goes from the battery via a 15 or 20 amp fuse straight to pin 9 (13 pin socket) or pin 4 (on the 12S) and have no other control. So when you plug your van in, there is a voltage from the tow vehicle present in the caravan all the time” well this circuit is the one that charges the leisure battery. Well some vehicles have a separate output from the ECU for this circuit, others have a second relay controlled by the ECU for this output too. In the future, it’s going to get very involved installing towing electrics into vehicles as they become evermore complex. Now we need to add something else into the mix….. Typical tow vehicle towing electrics – the relay can be controlled by the ignition switch, ECU or the vehicles ECO power management system. It’s NOT a split charge relay although often mistakenly called that. The fridge is also allowed to be connected to the electrical system, but only when the car engine is running other wise it would quickly flatten the tow vehicle battery. The fridge can never be run off the caravan leisure battery (although there is a connection so it can operate the gas safety valve and auto gas igniter). So how do we do this? Well, there is another lead that comes via the relay in the tow vehicle. Remember I said that there was a rely controlled by the engines ECU and only turned it on when the engine was running… well there is a circuit that runs from this relay to the caravan via pin 10 (13 pin socket) or pin 6 (on a 12S). When the caravan sees a voltage on this pin, it switches the caravan habitation relay over, disconnecting the caravan leisure battery from the caravan and connecting it to the charging circuit (pin 9 -13 pin socket, pin 4 on the 12S). This ensures two things… first – the caravan leisure battery can never supply the car with power – so if you have a flat car battery, it will not use the caravan battery to try to turn the engine over allowing the high starting current to destroy the caravan wiring and second – it disconnects the caravan’s internal 12 volts systems from the battery so nothing can operate and potentially affect the safe operation of the tow vehicle. Simple drawing showing the difference between the relays when the engine is OFF and the engine is RUNNING. It shows it is impossible for the tow vehicle to use the caravan battery for engine starting. A “split charge relay” and “voltage sensing relay” were originally designed for vehicles with dynamo’s or early limited output alternators and detected when the vehicle starting battery was charged by the voltage output of the dynamo or alternator. When the starting battery was charged, the voltage rose to 13.6 or 13.8 volts and the relay switched the output of the alternator over to the second battery so it could be charged. If the voltage of the starting battery fell below a pre determined level, the split charge relay would switch back and charge the starting battery again. On some of the more expensive voltage sensing relays you can adjust the voltage. If you have an aftermarket electrical towing loom fitted it might well be supplied with a voltage sensitive relay. On installation, the location of the relay is important. Some fitters install this in the rear of the car rather than the engine bay. This is incorrect, as the relay now has to ‘sense’ the voltage at the end of a cable that has run the length of the vehicle and itself is subject to a voltage drop. This will require the relay to be adjusted to accommodate this voltage drop. It also means that when you turn on additional accessories – headlights, heater fans, screen heaters, the voltage drop delta will change and the relay could then start to ‘cycle’ on and off. Realistically it should be installed in the engine compartment to be as accurate as possible. 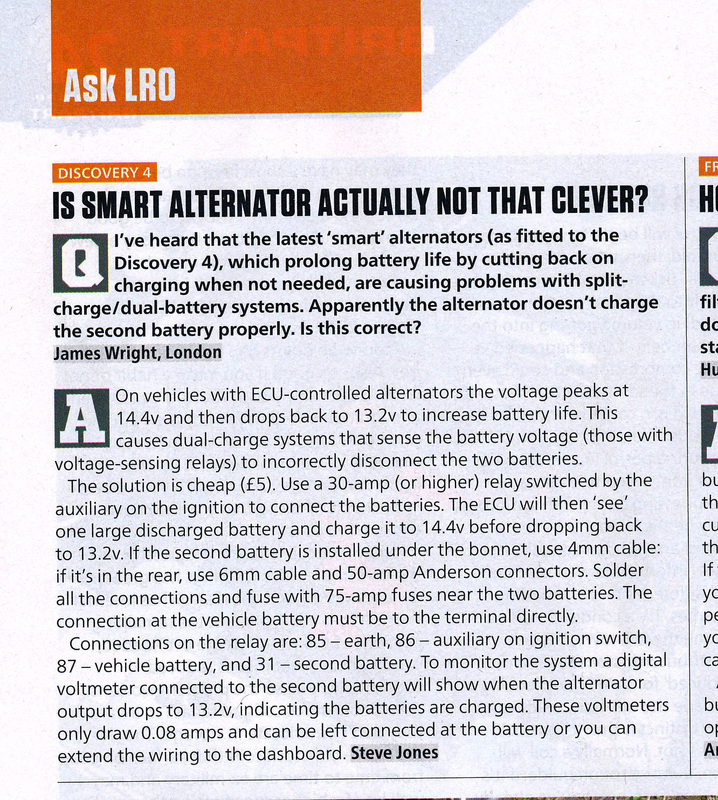 UPDATE: August 2013: This article appeared in LRO regarding the smart alternators in Land Rover Discovery 4 vehicles. It might also be relevant to other 4 x 4 and tow vehicles. SCR’s as opposed to VSR’s are now more than just simple relays. Originally they had to ensure that the were ‘make before break‘ switches, which means they connected the second battery before disconnecting the starter battery, otherwise allowing the alternator to go ‘open circuit’ was a sure way of prematurely ending its life. SCR’s now (and I don’t mean the trade name acronym used by General Electric to describe Thyristors!) use MOSFET and other technology to monitor batteries and dynamically switch and proportion charging… in fact many now incorporate some form of smart charging technology, facilities for connecting more than just two batteries and some even have shore power charging ability and AC inverters built-in. There are a number of SCR’s on the market that now also handle the alternator regulator function and require modifications to your alternator to improve charging capabilities. These however are usually more suited to marine use. One of the best companies I know off for this sort of technology is Sterling Power. You often find ‘split charge relay’s’ in 4 x 4 vehicles that have a second battery for a 12 volt recovery winch or in boats, where they have a normal engine start battery but may have a bank of several 12 volt batteries to provide power while under sail or moored without shore power. Some top end 4 x 4’s have alternators with a dual output for handling a twin battery system. For more information about the difference between Relay’s, Voltage Sensing Relay’s and Split Charge Relay’s read my post Relay, VSR, SCR… What’s the difference? Some people will tell you that you can check your alternator’s output by starting your engine, then disconnecting your battery to take measurements… some will tell you if you have a flat caravan battery to start your car, disconnect the good battery and connect the flat battery. Well, if you disconnect your battery with the engine running…. your off shopping later for a new alternator. Disconnecting your battery when your engine is running is a really bad idea. You will cause voltage spikes on the tow vehicles electrical system that might just see off your ECU and radio…. it will definitely see of the diode trio in the alternator. 2 – Start the engine. This now makes pin 10 (13 pin) pin 6 (12S) live and provides power to the fridge in the caravan. It also energises the habitation relay, disconnecting the caravan leisure battery from the caravan and reconnecting it to the tow vehicle charging circuit only. Actually is quite simple really…. even I got it then! Some things to look out for…. The cables on the towing electrics should be of sufficient size to carry the current required by various components in the caravan. Typically the road lights only need a 1mm or 1.5mm square sized cable. However, the charging circuit requires a minimum of a 2.5mm square cable as does the fridge circuit. If you look at the wiring diagrams above, you will also see that there are a number of neutral or earth cables. These are kept separate in the caravan and should never be linked within the caravan. The only time these neutral or earth cables are connected is when they come together to a central earth point in the tow vehicle. These cables should also be a minimum of 2.5mm square. If you want to install two batteries in parallel in your tow vehicle, or even in your caravan – especially if you have a heavy twin axle with a motor mover fitted, there is a right and a wrong way to do it. I’ve written a “How To: Connect Two Batteries in Parallel” guide. For fault finding on the leisure battery charging circuit, the first step is to make sure all is well with the tow socket on the vehicle. 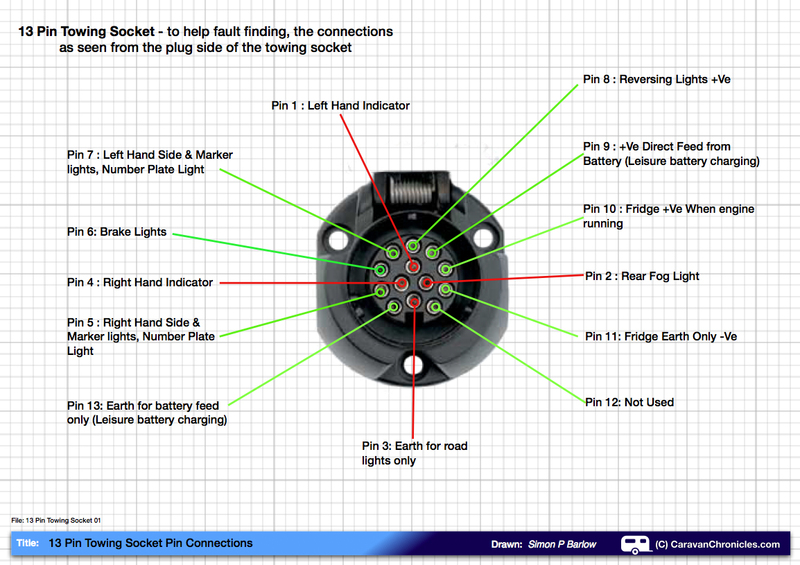 To help with out dismantling it I’ve done a drawing showing the pin connection from the socket side…. Fantastic, I,ve been trying to figure this out over the last week since fitting a 12S and most disconcertingly seeing my 12 Volt caravan panel shut down when connected to my car with the engine running. I thought it was behaving correctly, and this article confirms it. Very comprehensive article, I have read this with pleasure. I do have one question though that I have not found an answer to anywhere, and maybe you can help? If the leisure battery is fully (or close to) discharged, I would assume that it will pull all the power from the alternator that it could possibly get? would a 2.5 or even 4mm charging wire still be sufficient? What, bar from the fuse blowing, will stop the alternator from pushing 50 + amp into the battery? I am an electrician, but this really puzzles me. Just read your details relating to Understanding the Leisure Battery Charging very clear, my Bailey Pegasus hand book could do with this detail ! as it still shows the old set up. We had a 2005 Bailey Ranger from new which had the 12N & 12S set up and we could connect the tow car not running and power the van if we were out of power from the leisure battery, really useful when on CL’s. The Pegasus on the other hand does not allow this, I can see why now after reading your notes. I have noticed that while towing with the fridge on the leisure battery does not charge very well, if the fridge is turned off the voltage at the leisure battery increases to a level just below the tow car battery level. Is this because the fridge takes a relatively high load 10 amps which causes the voltage level locally at the van end to drop due to the load of the fridge ? therefore the leisure battery can only charge to a lower voltage level. Wonder if you have any thoughts on this. You are correct in your conclusion, when your fridge is switched on, the voltage drop will be enough to reduce the charging efficiency of your leisure battery. Generally, the effect should be minimal though and you should still be able to charge your leisure battery. However, it would be worth checking that the earth cables from the tow socket in the vehicle are in good condition and attached to a good earthing point on the vehicle. Sometimes the earth cables (there should be three – road light earth, fridge earth and leisure battery earth) are terminated on the same earth stud as the vehicle rear road lights and this can in some cars have a little bit of corrosion which could cause a high resistance connection, which in turn will lead to a slightly bigger voltage drop. I have even seen these ‘studs’ still covered with paint in new vehicles and no attempt made to create a good electrical contact. A lot of fridge/leisure battery problems can be traced back to poor earthing. It is worth noting that these three cables within the caravan should not be connected, the only time they connect should be within the tow vehicle. The second thing to look at is the size of the two feed cables running from your tow vehicle battery to the towing socket. They might go via relays, but the size should be a minimum 2.5 mm square, ideally 4mm square, to ensure the minimum voltage drop along the length. Something to consider when checking voltages is that if you have just started your tow vehicles engine, the alternator will also be trying to replenish the energy you have just taken out of the battery in starting the engine. I generally leave the engine ticking over for ten minutes (usually while I have a cup of coffee) to give the tow vehicle battery time to recover a little then take a voltage reading at the tow vehicle battery terminals, and the leisure battery terminals. Brilliant explanation, I think you have just answered all my doubts, but still not sure about a couple of things. I bought a Ford S max 4 weeks ago and when I got it home, discovered to my delight that it had a Ford Factory detachable tow bar fitted with a 13 pin swing down socket hidden underneath the bumper. I plugged this into a trailer board and all the lights worked and assumed that it was fully connected to charge my caravan battery and power the fridge while towing. So this weekend I converted the 12n, 12s plugs on my 2006 Elddis, to a 13 pin plug. Battery level indicator needle in van on control panel goes to zero – this is correct yes? All caravan lights do NOT work – correct or not? When car engine is off I cannot read any voltage on pin 9 of the car end socket with a volt meter? With engine running I have 12-14v on pin 10 of the car end socket but still nothing on pin 9 – correct or not? Your clarifiaction on this would be hugely appreciated and will save me calling out a towbar specialist. Sorry for the delay in posting back, only just got back from France with the caravan. “Now when I plug in the van to the car with engine running the following happens: Battery level indicator needle in van on control panel goes to zero – this is correct yes?” – Yes, the habitation relay will disconnect your caravan battery from all the internal caravan 12 volt circuits. “All caravan lights do NOT work – correct or not?” – All the INTERNAL caravan lights will not work with the car engine running. Obviously all the road lights (stop, tail, indicators etc) will work. “When car engine is off I cannot read any voltage on pin 9 of the car end socket with a volt meter?” – If you have a SCR (Split Charge Relay) installed in the car then this is correct. Some cars now control this relay from the car’s ECU and don’t turn the charging relay on until the engine is running. You would need to check this with Ford. Other cars that have larger alternators don’t have SCR’s and simply connect pin 9 straight to the tow vehicles battery via a 15 or 20 Amp fuse. Not knowing the exact details of the vehicle I would expect a voltage on pin 9 and pin 10 with the engine running. With the engine off, if there is no SCR, then there should be a voltage on pin 9 only. If you can, check all is well with the van’s electrics by plugging it into another vehicle. You may have done this already. Next, look round the engine bay close to the battery for two fuses. One will be for the charging circuit, the other for the fridge circuit and check these are OK. It would then be a matter of tracing the two wires back through the car to see if you can find any relays in the charging circuit and make sure it’s working OK. If it is an old installation, someone may have installed a voltage sensitive relay. Some can be adjusted, others are pre set and can’t. Thanks for your very prompt and concise reply. I am happy the van electrics are ok as it has been fine when I was towing with my A4 which has twin electrics fitted. Everything above appears to be how it should be except for the lack ok 12v on pin 9 on the 13 pin socket attached to my car. I was just wondering if this voltage would only show with the van connected due to some earth return needing to be in circuit or something? I spoke to a towbar specialist today and they suggested that I connect up the van to the car but disconnect the terminals on tgeht van battery. Then read accross the terminal connectors to see if there is 12v accross them, which would indicate if a charge is getting to the battery. Sounds logical I supppose. I will try this along with your fuse check in engine bay suggestion, I presume you mean the car engine bay and these fuses should be near the car battery? In the boot I can see the wiring loom for the electrics with 3 fuse boxes containing relays and some fuses but I have idea which fuse is for pin 9. I will check them all but won’t know if one is actually missing or not. If you can get a voltage reading on one pin but not another, the earth connection for the multimeter is ok. I don’t think it is anything to do with the earth return path for the individual circuits as you are reading voltages on the pin connections on the car socket. Regarding the advice from the towbar specialist… to my way of thinking if you can’t get a voltage reading on pin 9 (charging circuit) with the engine running, then I can’t see that removing the leisure battery and checking for a charging voltage will achieve anything. If the van worked on your previous car, and nothing has changed with the van, then I would suspect the vehicle more than the caravan. Usually the fuses for the two high current circuits are near the tow vehicles battery, however, some manufacturers install a high capacity circuit to the rear of the car and the canbus controls devices powered by this circuit so the fuses may well be in the boot. It might help to work out what fuse relates to which circuit if you look in the handbook. Some times manufacturers list all the fuse designations and just say some systems may not be fitted in your model/country. If the tow pack was fitted by an independent agent – does it require a reprogram of the ECU to allow all the services to work? Sometimes people have tow packs fitted to pull a small trailer and skip out on having the dealer updating the ECU as there is usually an additional cost involved. All now working, the answer is that Ford appear to be cheapskates! I had a towbar specialist take a quick look and it was discovered that pin 9 had a red wire attached to it that went knowhere, it was simply coiled up! So when Ford factory fitted the system they simply didn’t bother to connect pin 9 to a permanent 12v feed which sounds crazy bearing in mind that they have fitted a full Ford wiring kit cpmplete with relays, fuses etc. I probably could have discovered this for myself but just didn’t have the time between now and the weekend to have a proper look, as we are going away in the van on Saturday. So there we are, problem solved. Pin 10 supplies the switched power to the fridge and by the sound of it also to charge the van battery. This is done by the van’s electrics and relays. He suggested that if the battery voltage is dropping in the van and the interior lights do not funtion when connected to the car, this would suggest that the system is operating correctly and a charging voltage is getting to the battery. He said that the permanent 12v feed that is now on pin 9 is only used to power the interior lights on the van when connected to the car in place of the van’s battery being disconected as mentioned above. So in essence, when connected to the car the van’s battery disconnects so it can charge (pin10), and pin 9 provides the missing 12v to supply the interior lights instead. Anyway, I now have switched power on pin 10 and permanent on pin 9, so all is good. Thanks very much for all your advice Simon. Hello Simon, very good article. can you please explain to me why 2.5mm2 is enough for battery charging? What about voltage drop and the possibility of the wiring or the pin 9 failing when the leisure battery is near to empty and ready accept a heavy charge. Or. does the circuit just rely on the fuse blowing? Or, is it not possible for the 2.5mm2 wire to be overloaded? It all just seems a little inadequate, or am I miss reading it. Most 2.5mm2 cable is rated at around 25 amps, which will usually be sufficient to carry the load in the leisure battery charging circuit. The voltage drop for 2.5mm2 cable can be calculated using the formula mV/A/m or millivolts per amp per metre. Typically a 2.5mm cable has a voltage drop of 15 mA per Amp per metre. So a 10 metre cable carrying 25 amps would have 15mA x 25A x 10m = 3750 mV or 3.75 volts. The same cable carrying 10 amps would have a voltage drop of 15mA x 10A x 10m = 1500 mV or 1.5 Volts, so it can be seen that in some respects the cable itself can limit the circuit – as the current increases, the voltage drop also increases. With good quality 13 pin connectors, it is unlikely that any of the pins will fail due to over loading. The nickel pins offer a slightly lower contact resistance due to contact surface area and increased contact pressure over the old style split brass pins. I understand that the original German DIN specification was for each pin to take a sustained 30 amp load. The other factor to consider in the charging circuit is the internal resistance of the leisure battery. Even a fully discharged battery has a resistance and this internal resistance limits the charging current. Batteries have two internal resistances… a forward resistance and reverse resistance, these different resistances are what limit the discharge current and charging current. The only way to increase the charing current is to increase the charging voltage above what a normal car alternator is regulated to output. Some smart chargers can pulse a high voltage across the battery plates as part of their bulk-absorption-equalisation-float charing cycle. Unless there is a fault, I don’t think it’s likely that a 2.5mm2 cable in the charging circuit would be overloaded. In general terms it is always best to protect the circuit with the lowest rated fuse required. On my Freelander I have two 15 amp fuses installed – one for the fridge circuit and one for the leisure battery charing circuit and these work fine even though all the cabling is 2.5mm and could theoretically supply up to 25 Amps. Pin 4 (12s) and pin 9 (13 pin) should be a permanent power supply all the time on all tow vehicles, your write up says this supply on most vehicles (excluding some larger 4 x 4 vehicles) is controled by a split charge relay or by a standard relay that is controlled via the vehicles ECU or even controlled by the vehicles ECU directly, this means that your saying this is a controled power supply when if fact it should not be. Then at the end of the write up, when it says; Ok give me all that in plain english, the instruction say that pin 4 (12s) and pin 9 (13pin) are a constant power supply which will energise your AL-KO ATC System and power your internal electrics on some caravans directly from the drawing vehicles battery ETC, as the vehicles engine is not running at said moment in time. Thanks for the comments. I agree with what you say, however….. The factory wiring looms supplied by two vehicle manufacturers have Pin 4 (12s) and pin 9 (13 pin) the ‘permanently live’ feed controlled by the vehicles ECU and in certain circumstances the ECU can shut off all electrical supply to the caravan with the exception of road lights. One of the times this can happen is if the engine is put into a reduced power “limp home’ mode. So as you rightly say this should be a permanent feed not switched, but it seems that this might not always be the case. I have asked for further information on this but have not received replies to my questions. 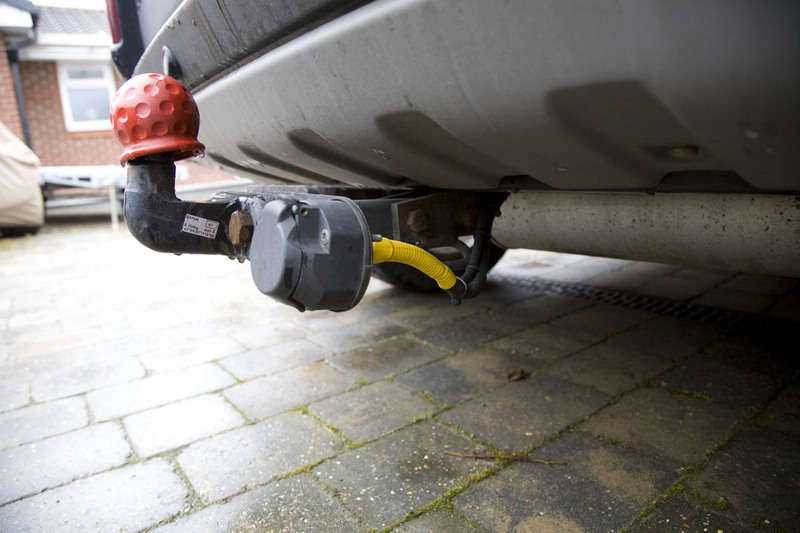 This has implications with regard to electronic braking assist systems fitted to caravans which rely on a permanent feed from the tow vehicle. If the tow vehicle goes into ‘limp home’ mode and shuts off the power, this will disable the electronic braking assist system. If I get any further information about this, I’ll certainly update the article. Many thanks for your reply, Yes I understand what you are saying and it makes sense, please accept my apologies for doubting what you had written, it seems I have more to learn about modern ECU controlled vehicles. This is a really good explanation and has certainly helped a novice at caravans and electrics! Some of my concerns have been removed but I still seem to have a fault which I can’t work out if its the car or the caravan. I have a new lunar quasar and the tow car is a 2006 Santa Fe. My issue is that the fridge won’t charge when the engine is running. When attempting, the fridge tries to start and there is a clicking noise coming from the fuse box but nothing happens. I wondered whether this may simply be a blown fuse but I’m not sure which it would be. Lunar handbook is pretty useless! When the engine is running the lights wrk fine and the leisure battery read zero so the relay seems to be working from that perspective. Any ideas? As I don’t know the details of Lunar van or which fridge is installed it maybe quicker asking the question on caravantalk. would get you help a little quicker as there will be a number of Lunar owners there. I’m just trying to run the fridge whilst travelling. The fridge has a battery setting which it’s definitely on. This is my 1st van and tow vehicle so no other experience although it was working fine during our 1st few trips so something has gone wrong since. I will have a look on caravan talk. I’ll email something across later this evening. I assume you mean a 12 volt 110 Amp Hour (Ah) battery. You can use a 12 volt 110Ah battery to run the 12 volt accessory sockets in your caravan – these are the ones that look like a car cigarette lighter socket or in some older caravans a 2 pin flat blade socket. Car cigarette sockets are usually fused at 10 Amps or 15 Amps maximum. I would suggest contacting a local caravan engineer or qualified electrician if you are unsure about anything to do with the electrics. If you do not have your caravan connected to a car, you will need to charge your battery using a suitable mains charger connected to an electrical supply. The only way you can tell the state of charge of your leisure battery is to use a voltmeter and read off the voltage before charging and a couple of hours after charging. The meters and LED lights on chargers are not really reliable or accurate enough. A simple digital multimeter from Maplins (£5 to £10) would be good enough. My recently purchased used caravan has a 13 pin plug, but pin 10 is not wired and it draws all the current for the internal electricals via pin 9. I am updating the caravan wiring as per your diagram above. My towcar has a split charge relay fitted on the cable between the alternator and pin 10. Is there any point in leaving the split charge relay there as this circuit will only be powering the fridge? Pin 10 is for the caravan fridge use only. Pin 9 is for charging the leisure battery and should be live permanently connected to the tow vehicles battery via a 15 amp fuse. From the sounds of it, I would guess that the previous owner did not use the fridge while towing therefore pin 10 was never connected. 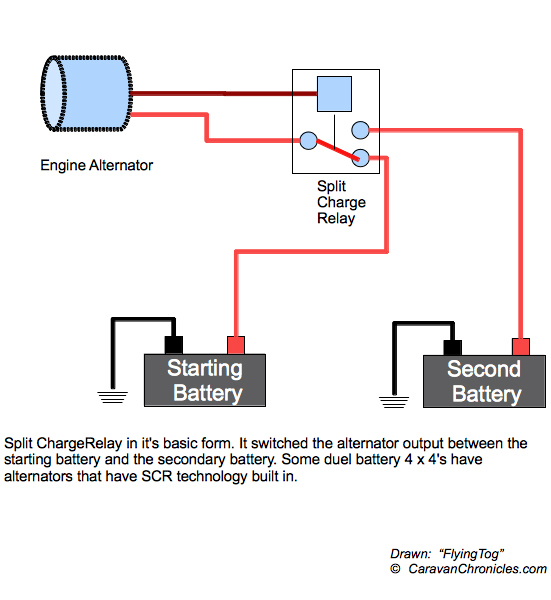 The relay fitted in your tow vehicle, is it a true split charge relay (i.e. a voltage sensing relay) or just a normal 30 amp relay? I assume the split charge relay in your vehicle goes to Pin 10 (fridge) from what you have said. In your situation I would make sure that Pin 9 from the plug is connected to the caravan’s habitation relay and I would connect Pin 10 to the fridge, with a spur to the coil side of the habitation relay. With that done, if it is a voltage sensing relay in the car, I personally would swop it for a standard 30 amp relay operated from the ign contact on the alternator, or if your vehicle has it, the correct contact on the ECU. If you check on line you should be able to find the wiring diagram for the OEM wiring harness for the manufacturer’s tow bar electrics, this should tell you if you can connect to the ECU. The reason I’d swop out any voltage sensing relay is if it detects the voltage is to low in the tow vehicle, it will switch off, which means the supply to the fridge will turn off and therefore the habitation relay will switch over and the charing current will be turned off. Additionally, for caravans fitted with AL-KO’s ATC system, pin 9 must be live permanently so that ATC can work and should never have any relay in the tow vehicle that can affect the power supply to it. The relay on the car is a voltage sensing relay. When I bought the caravan and saw that it had a 13 pin plug I got a local workshop to upgrade the towing electrics from the 7 pin socket that was fitted on the car to a 13 pin one. They recommended a voltage sensing relay and gave me the documentation. It connects at 13.3 V and disconnects at 12.8 V. It can pass 125 A of current, continuously and 140 A for short periods. I started the car, and did not touch the accelerator. I switched on every electrical device in the car and checked the voltage over pin 10 & 11 with the car idling. It was 14 V ± 0.1 V.
Thanks to your excellent help page I realise now that a split charge relay is an old fashioned concept that is not necessary on a modern towcar, but I will stick with the current relay for now. My next car will be equipped with a simple relay. The caravan is a Caravelair from 1999, the wiring appears to be original. There is an impressive looking fusebox, including a 220 V to 12 V transformer and a double pole ELCB. The 12 V side is extremely simple. All current comes from pin 9 & 13 and powers everything in the caravan, including the fridge. The leisure battery in the caravan is also connected to everything including the fridge. All in all a recipe for a flat car battery. There is no habitation relay and pin 10 & 11 do not appear to be connected. Do you have any experience with a “Battery booster”? It is a device fitted beside the caravan battery that takes the current received from the car and transforms it up to 14.4 V to ensure complete charging of the leisure battery. Sounds like you have one of the ‘better’ voltage sensing relay’s. No point in changing it for changing’s sake! With that current rating I wonder if it is one of the solid state units? Although the car voltage is ok when lights, screen etc are on, just do the test again when the van is connected just incase the additional load of the van on top of the car’s load doesn’t drop the voltage below the cut off point for the relay. It’s a belt and brace thing really, I think you will be fine though. If you are modernising the van’s 12 volt system, you could easily include a habitation relay… it’s only a simple 30 amp change over type. I don’t have much experience with the ‘battery booster’ type units. The only one I know about is made by Sterling Power, but it is something that I have been pondering on for a while. I think C-TEC may make one, and if their chargers are anything to go by, it should be a good product. If I can help with anything else… just post a comment. I have bought a 30 A changeover relay normally used in car lighting circuits to use as the habitation relay. I live in Norway. The battery booster of choice over here is from the Swedish firm LEAB. Caravanners who have installed it speak warmly of it. The LEAB 1412 costs around GBP 120. There is some info here (in Swedish): http://www.kamafritid.no/Welcome/Default.aspx?scenarioID=301&StockCode=E31-23 I can do on the fly translation for you if you are interested. It will boost incoming current to 14.4 V even if it is as low as 10 V and can load the leisure battery at up to 12 A. A safety feature claimed by users (but not by the manufacturers) is that by limiting the current charging the leisure battery, cables between the cars alternator will never be overloaded if the leisure battery is very low and draws a high current. I don’t have your electrical knowledge, but I can’t understand how a battery in a low charge condition can draw so much current that it can melt cables. When rewirering my caravan I am going to install fuses. That looks like an interesting bit of kit! I got an english translation on the web site, but I could not find a manual for it. Will have a look via Google. Does it install in the caravan or in the tow vehicle? With regard to battery charging, batteries have two internal ‘resistances’. One is the ‘forward’ resistance that when you discharge a battery the internal makeup and chemistry limits the current if it was a direct short – it’s a lot of amps but the energy is released over a few seconds. The second, ‘reverse’ resistance is almost the same and is due to the internal chemistry, but this time it is when you apply a voltage to a battery to charge it. If you apply say 13.8 volts, the internal resistance limits the current. If you want to increase the current, the only way to do it is increase the charging voltage across the battery, Thats how some intelligent chargers can recharge as battery quickly, they step charge by changing the voltage in steps. Obviously as the state of charge, hence the chemistry changes, the internal resistance changes too. As the battery reaches about 80% of its max charge, intelligent chargers raise the voltage. So this bit of kit will charge at 14.4 volts and I suspect if you do the maths, this works out to about 12 amps charing current for most 12 volt lead acid batteries. If you think about it, a car battery is connected directly to the alternator and it doesn’t melt cables as the output voltage is usually limited by the alternators regulator to around 14 to 15 volts. Sounds like you have a nice little project! The booster is installed in the caravan, as close to the leisure battery as possible to keep the length of the cables as short as you can. I am considering replacing the battery charger in the caravan. The present one is not automatic, and I keep forgetting to switch it on, or sometimes switch it on the wrong setting (eg. “motorcycle battery”). The caravan has a 220 V – 12 V transformer, so I only need a purpose built battery charger. LEAB offer two battery chargers for charging a 12 V battery from 220 V. One charges at 6 A, the other at 30 A. They are attractive for caravan use as they are fully automatic and have no fan for silent operation. The 6 A charger costs GBP 120, while the 30 A one costs GBP 200. I feel that the 6 A will suffice, but do you feel that a 30 A charger is a better buy? The caravan has a 100 Ah battery and, by today’s standards little 12 V equipment. Most of the current caravans seem to have a 12 volt charger around the 15 to 20 amp range, but these are also able to supply the van if there is no leisure battery fitted. I would think that a 6 Amp would be OK as it will only be charging the battery, not having to supply the caravan without a battery. There may be times when you are using more than 6 Amps in the van during the evening, but the charger then has overnight to replace what was used. Additionally, you are going to always get a good charge while towing. The caravan has now taken a step into the 21st century. 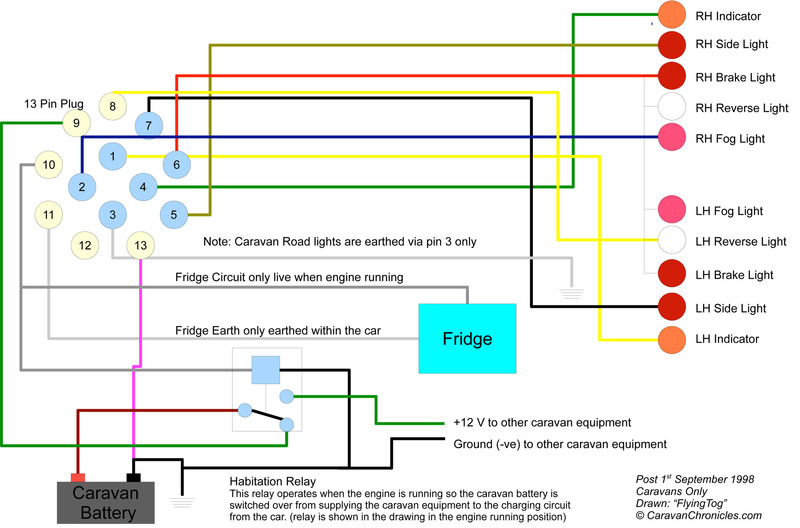 I followed your wiring diagrams and the fridge switches off when the car does, and the habitation relay disconnects the caravan battery when the cars engine is not running. The original factory wiring was even stranger than I had supposed. The 13 pin plug was connected to the caravan by an 8 core cable. The “dead” pins were 8 (understandable as there are no reversing lights) and 10, 11, 12 & 13. Pin 3 was the earth for the entire caravan, road lights as well as the internal electrics , and fridge. When fitting new cable I replaced the plug with a new 13 pin one from Nembers. A previous owner had messed with the original plug, removing the locking threads and the bit on the top that locks to the socket flap. It sounds like you are moving forward at quite a speed! I guess the previous owner had ‘modified’ the wiring to suit.. along with the plug! Not that you will need it, but on the ‘Help Guides’ page I have added a section ‘Fault Finding” and started off with three simple guides. If you know anyone with a caravan that has an interest and wants to learn more… pass on a link to the page. I’ll be adding a couple more in the near future. I am reading all this info hoping I get a solution to my problem. I am desperately trying to find out why my caravan fridge won’t work whilst connected to my car. I switch the fridge to battery, but as soon as I do this I hear a relay clicking on and off at the front of the caravan. The lights flash on and off with the relay. It’s about 2 seconds on, 2 seconds off. This only happens when fridge is switched to battery. There is a control box in back of my car that the 12N and 12S sockets are wired to, I’m wondering if the fridge is drawing too much current from this and making it trip out or something? Have you ever heard of this happening before? I basically can’t use my fridge whilst travelling as a result. Also an I meant to select car battery on the caravan control panel or will the fridge find the 12v from the car automatically? It’s a bit difficult trying to diagnose a fault without knowing the tow vehicle, caravan and fridge type but I’ll give it a go! The clicking in the caravan is probably the habitation relay, this is actually a switch that is turned on and off by the electrical supply to the fridge, so the clicking is actually a result of the fridge supply being turned on and off. So for the moment we’ll discount the clicking in the caravan, but it does give us a clue to what’s happening. If the fridge supply is being turned on and off, that is controlled by another relay in the tow vehicle. If everything worked OK, when you start your car’s engine, the output from the alternator is sufficient to run the fridge and a relay is turned on in the vehicle to send power to the 13 pin socket, or in your case to the 12S socket which connects to the caravan. This relay is either a “normal’ relay that is turned on by the vehicles electronics or more probably in this case a ‘voltage sensitive relay’ which senses the voltage of the cars electrical system and only turns on when a set voltage has been reached, i.e. when the engine is running and the alternator is producing an output voltage of sufficient level to charge the vehicle battery and run the caravan systems. Voltage sensitive relays can cycle….. turn on and off every couple of seconds. This is usually because a load is turned on… for example turn on the heated rear window and the voltage drops enough to turn the voltage sensitive relay off. As it is cycling on and off, its highly unlikely that the fridge is faulty as it would have blown a fuse if it had gone short circuit. As you have 12N and 12S sockets, it could be that some of the brass pins have corrosion on them or have opened up and aren’t making good contact, in which case some of the pins could have gone high resistance. This is worth checking out… don’t forget to check the earth pins too. However, I suspect that the voltage sensitive relay needs adjusting, it’s turning off at too high a voltage. Most have a way of adjusting the sensitivity (i.e what voltage it turns on and off at). If it’s a new vehicle installation, there should be a manual for the relay left with the vehicle. If it’s an old installation, you might be able to find instructions for the relay on the internet via Google if you haven’t got them. If the installation has been working OK for a while and it’s just started happening, it ‘could’ be because the vehicle’s battery is becoming old and now requires more current after starting the vehicle to replace the energy used than it did when it was new. You could try leaving the caravan connected with the vehicle engine running for 15 minutes and see if it still happens to test this one out. As ever, it is always worth checking the earth connections for the 12N and 12S within the vehicle as over time they can get some light corrosion and need cleaning. Now there is one more thing to throw into the mix. As I don’t know your vehicle, it could be one with a ‘smart’ alternator. These alternators measure the vehicle battery charge and to prolong the life of the battery and save energy reduce their output voltage. I know Land Rover Discovery 4’s and the latest Range Rovers have these fitted and this is causing problems to tow bar electrics that are not OEM and fitted with voltage sensitive relays. Thank you for writing such a comprehensive article. It’s certainly cleared up many areas of confusion in our household! I do have one question, though. Forgive me if this has already been covered, but I couldn’t see anything above quite answering my query. We have just purchased a Coachman VIP520/4 2010, and we are changing over the Tow-Bar electrics on our Citroen Dispatch to the 13pin standard. My concern is the Pin 9 circuit which, on our van, will carry both the charging circuit current as well as the Al-Ko ATC system’s current. Your article recommends 2.5mm cable for the charging circuit, but will this be enough to energise the ATC system as well? I cannot find any power consumption details for the ATC Systems, and I’m not entirely clear on how much current the typical leisure battery draws (on average) when it’s charging. Bearing in mind the length of our tow-vehicle as well as the power consumption of the ATC and Charging Circuit, should we be looking at a cable with more ‘girth’!? I believe the 12v wiring on the caravan side is 4mm, having spoken to the caravan manufacture on a different matter. Many thanks again for your time and efforts on this page! The standard 13 core cable for a 13 pin plug on a caravan uses 2.5mm sq for the charging and fridge circuits (+ earth returns) and 1.5mm sq for the road lights. My 2006 Freelander factory fitted electrics are 2.5mm sq and work fine with our 2011 Sterling Celebration 550. An AL-KO ATC system takes around 15 Amps when first connected to go through its self test ( I think it takes around 15 seconds) and then around 40 or 50 mA after that. A leisure battery can take around 15 Amps via the charging circuit, although it is usually lower due to voltage drop and internal forward resistance. 4mm or 6mm sq cable on a caravan is usually used between the battery and inbuilt charger unit. Thanks for your swift reply. So despite the fact that the charging circuit could pull around 30A at peak moments (ATC @ 15A + Charging @ 15A), a 2.5mm cable should still be OK over the 3m or so because it will only peak at 30A for a brief period? I guess we should look at using a 30A fuse inline on that circuit, though, rather than a 15A or even 20A? When you plug in the 13 pin plug to the car, the engine is not running, therefore the fridge circuit is not energised. It’s the fridge circuit that operates the habitation relay, so when you initially connect up, the leisure battery is not in the charging circuit so the test current of 15 Amps drawn by the ATC unit comes straight from the tow vehicle battery. Only when you start the engine does the fridge circuit become energised, therefore operating the habitation relay and allowing the leisure battery to be charged. With the engine running, if the ATC operates, it draws current from the charging circuit which effectively has a ‘supply’ at both ends (the tow vehicle and the leisure battery) and due to the difference in volt drop between the tow vehicle and ATC and the leisure battery and ATC, it will receive current from both ‘ends’ of the circuit as the ATC unit while operating will have a lower resistance than the leisure battery. This is another reason why you should never connect up (electrically) caravan and tow vehicle with the engine running. I would not increase the fuse rating above the carrying capacity of the cable. Hi Simon, I would just like to say how heplful your instructions and comments are. I am preparing to by a caravan for the 2014 season and I am going to fit my own towar and 13 pin wiring, its reasuring to know that there is someone who will give help advise, not the usual response of “oh you will have to bring it to us mate” at £60 an hour, sorry for being synical but you know what I mean. Before committing to buying any particular wiring kit, I’d check with Ford that the ECU doesn’t have a signal output for controlling a relay for the fridge circuit. The habitation relay in the caravan is controlled by the fridge circuit. 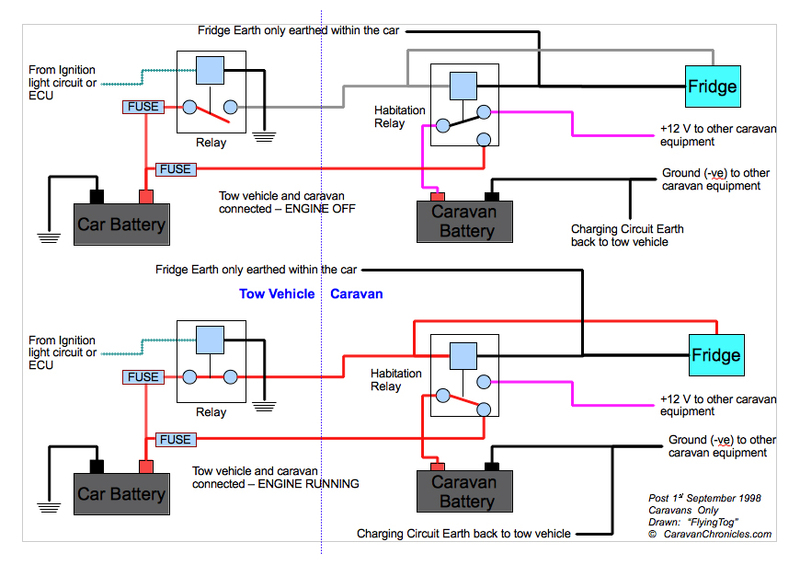 Until the fridge circuit becomes ‘live’ the habitation relay does not connect the charging circuit from the car to the caravan’s leisure battery. A voltage sensing relay (such as the Ryder one you quoted) will allow the vehicle battery to charge and when the voltage rises to a pre set value, the voltage sensing relay activates and allows power to the fridge circuit and in turn switched over the habitation relay allowing the leisure battery to charge. However, if the ECU detects the vehicles battery is nearing its full charge, it can reduce the output of the alternator before the voltage sensing relay has turned on and therefore the fridge circuit never activates and hence the habitation relay never changes over. This can sometimes lead to voltage sensing relays “chattering” (turning on and off rapidly) or never activating. One of the easiest ways to check if the ECU has a specific output is to check the electrical wiring instructions that are supplied with a Ford factory wiring kit for 13 pin towing electrics. Usually the wiring diagram will have a lead from the coil side of a ordinary 30 amp relay going to a specific terminal on the main vehicle fuse board. (Land Rovers since 2006 are like this). I think I am maybe reading to much into this charging the lesuire battery/Fridge charging thing. I been looking at your circuit showing the relay operation showing with engine off/engine on it looks and works so simple it seems allmost to good to be true, but after studing it I think it is true and the landrover article seems to confirm it ture. So a simple £5 relay with the coil switched by the charging circuit, controling the habtation relay, the ECU or the charging circuit just sees one battery. Now have I got this right now please advise. The whole caboodle is really quite simple and once you get the ‘light bulb’ moment…. it all becomes clear. You are spot on, a simple £5 30 amp relay does the job nicely. The trick is once the engine has been started, the relay in the car turns on and as far as the car’s brain is concerned, you just have one big battery. When the vehicle battery becomes charged, even though there will be a slight volt drop along the cable to the leisure battery, it will still get charged as the car’s brain ‘thinks’ the vehicle battery still needs the charge ‘topping off’ and continue to allow the alternator to give a suitable output. As the vehicle battery doesn’t need this extra, the battery’s internal resistance will be high enough so it doesn’t receive any more charge, but the leisure battery will continue to charge. When looking for a electrical towing kit make sure that the cable is a MINIMUM size of 2.5mm Sq… if you can try to go for one that is 4mm Sq for the fridge and charging circuits to minimise the voltage drop – Obviously the two earth cables need to be 4mm as well. Thank for your reply and your help, I’m not as clever as I thought I was I,never even considered the voltage drop between the car and the caravan was so important. I was just happy to understand the diagram glad you explained that it all makes much more sense now I will let you know when I have completed the job, thank you again. Thanks for taking the time to write this article – it was most helpful. I’m planning the electrics for a simple VW T5 conversion where I will have two batteries (vehicle and leisure) linked with a DVSR link this one. I also intend to connect a mains charger to the leisure battery. My question is should I have some sort of relay that disconnects the charger while the engine is running or if it is not mains powered? Or will it be ok left in circuit all the time? Thanking you in advanced of your time answering my question. The relay you have selected is a good choice, it won’t have any problems while the engine is off and you are on EHU charging your leisure battery. However, your question was will the charger be OK while the engine is running and not on EHU. Difficult one to answer as all chargers are slightly different. If you have checked the charger manufacturers instructions and there is no mention of the charger being OK if connected to a battery that is recieving a charge from an alternator, personally I’d make the assumption that it’s not OK.
It’s a simple thing to correct however. By installing a relay that is controlled by the ignition light on the alternator, when the engine is running, the relay will switch over disconnecting the charger from the leisure battery, stop the engine and the charger will be re-connected again. This also might be safer. I have noticed a couple of times VW campers running their engine for a while on cold mornings while still plugged into the EHU, so installing a relay would make sure you don’t damage your alternator or charger. Thank you so much for your reply. The charger I intend to use is this one by CTEK http://www.amazon.co.uk/dp/B005O8YG44 I’ll take a look at the manual. If I could steal a little more of your time and borrow a snippet of your wisdom could I ask you to recommend a relay to do as you suggest. Any automotive 20 amp changeover relay is OK. I would stick to an automotive type as they are commonly available and most caravan electricians know about them, so if they see it in the future, they won’t run a mile! A change over relay is sometimes known as ‘five blade relay” as they have 5 blade contacts. The reference is usually R20BC and they are around £5 to £6 for a quality make. I would suggest buying a relay socket for it to plug into, it makes wiring a lot easier and if there is a problem in the future, its easy to change the relay. There are other suppliers of course. I would suggest a small investment in a good ratchet crimping tool and insulated crimp terminations, it will allow you to do a top quality installation. I’m not 100% sure of the electrical system for your van, but lets see if we can get somewhere. First, even a completely ‘dead’ battery gives out a volt or two so I don’t think it’s dead. A 0v reading sounds like there is a disconnection, a fuse blown or it’s not turned on. The reason you get 14.6 volts indicated when the charger is turned on is that it does two jobs, one it charges the battery and secondly it can supply the 12 volts system on your caravan if you don’t have a battery connected. So if it indicates 14.6 volts it is working and supplying an output. On a lot of caravans there is a switch, usually marked “Van – Car” if this switch is set to ‘car’ it will power the caravans 12 volts system from the car battery – assuming the car is connected of course. Check to see if you have a “Van – Car” switch and set it to ‘van’. The next check should be to confirm that the battery fuse is OK. Sometimes this is on the main fuse panel but often it is on the positive lead coming from the battery box into the charger/main 12 volt electrical fuse panel. Usually it is rated at 20, 25 or 30 Amps. Locate the main battery fuse and check to see if that is OK. If the “Van-Car switch is set to ‘van’ and the main battery fuse is OK, you will need to start checking with a multimeter to confirm that 12 volts is leaving the battery and reaching the 12 volt electrical fuse panel. If you check the “van-car” switch and the main battery fuse and you still have no power, post back and I’ll go through the next steps with you. I have a Kia Sorento 2008 which I purchased 2nd hand which was already fitted with a tow bar and 12n and 12s sockets. I found a company that supplied a metal wireless reversing camera which had good heat resisting properties and could be used for continual viewing whilst driving and not just for reversing. Having first checked with the caravan service centre I proceeded to fit this to the back of the caravan linking the 12v supply to the orange cable (12v ve+) just before it enters the caravan fuse box and gave it a separate fuse only to find that it was not receiving any power from the car with or without the ignition on. On further checks with a multimeter I found that the fridge 12v system also did not receive any current with or without the engine running. it turned out that the 15amp fuse from the battery had blown and was probably like it for some time. On further investigation of the car electrics it would appear that the system is running from a single supply from the battery via a 15amp fuse without any relays that are obvious, unless they are located to the rear of the vehicle. On renewing the fuse the power was restored to the towing sockets and the caravan. However, pins 9 and 10 become live whether the ignition is on or not. Seeing your write up on all the safety aspects, is my system operating correctly? I don’t mind the 12v ve+ (pin 9) being live all the time when connected as my camera wouldn’t work all the time as intended and I would need to connect to the fridge terminal (pin 10) to get the same option. I am minded to have the system on my car checked out but you did mention that some big 4×4 do have just a supply to the battery via a 15amp or 2oamp fuse, but you didn’t say if this is OK. Have you any views please. The orange cable should be connected to pin 9 which is the +ve 12 volt permanent supply and this should be OK for your camera. Within the tow vehicle, there should be two supplies running from the battery, a permanent supply for pin 9 fitted with a 15 or 20 Amp fuse and the second supply to pin 10 (grey) fed via either a 30 Amp relay or voltage sensing relay. This should also have a 15 or 20 Amp fuse depending on cable size. 2.5mm sq (15 Amp) or 4mm sq (20 Amp) is usual. When tow bars are fitted, the fitters usually install the relay in the boot/luggage area as usually they have had to remove some of the interior panels to make the light connections and it makes the job easier installing the relay here rather than installing it in the engine bay. Once installed all they have to do is then run the feed wires to the front of the car and connect via a fuse. Voltage sensing relays should ideally always be installed close to the battery for correct operation. It might be worth checking to see if there is a relay of some sort installed behind the panels in the load area of the tow vehicle. I have a sneaking suspicion though you won’t find a relay and the two pins (9 +10) have just been fed from one cable. If this is the case, I’d install two new cables direct from the battery via 20 Amp fuses and a 30 Amp relay for pin 10. I ‘might’ be a voltage sensing relay that has been adjusted so that it is on all the time, in which case it needs adjusting to the correct setting. Not all voltage sensing relays are adjustable though. It could also be worth searching on the internet to find the instructions for the factory (OEM) trailer wiring kit. It might shed some light on the current set-up. Personally with the fault of both pins being live with or without the engine running and the setup having previously blown the fuse I would come down on the side of caution not use the vehicle for towing until the condition of the current wiring is established and the fault rectified. Many thanks for a prompt reply. I think your suspicions are the same as mine and the blown fuse is a bit of a giveaway. It had a 15amp fuse in it and I replaced it with a 20amp, perhaps not a very good idea. I’m going to fix up for a tow bar company to sort it out. I think it will be worth it in the end. I should have taken more note when I purchased the car last year and took the caravan to Spain only to find the fridge wasn’t cold and the caravan battery was flat when I tried to use the mover. Hi Simon, I have fitted a vehicle specific wiring kit to my 2014 Rave4 with a voltage controlled relay that switches about 13.2 volts.The problem is when stopped with engine running if I have headlights on the voltage drops below 13.2 which drops power off pin 9 which drops relays fittied in my Bailey caravan for fridge etc. and AL-CO ATC.I don’t mind the fridge going on and off but I think I could do damage to the ATC unit.Is there a voltage controlled relay that is adjustable to say 12.8 volts.Can you help please,Mike. Pin 9 should be permanently powered and the Al-KO ATC system should be connected to this pin within the caravan before the habitation relay. Pin 10 which is the fridge circuit is the one controlled by the relay (ordinary or voltage sensing) and if it drops out due to low voltage in the tow vehicle, it should not affect pin 9 or the Al-KO ATC. It will however allow the habitation relay to also drop out so the leisure battery isn’t being charged. If it’s a just an ordinary relay connected to a specific point in the vehicles wiring, it could be the vehicle is turning the relay off as the electrical system comes under load.. i.e. turning your headlights on. However if it is a voltage sensing relay, then replacing it with an adjustable one will require it setting so low that it will be on most of the time. It would be cheaper to just use a plain 30 Amp relay and link it to the vehicles ignition circuit. However a good quality adjustable voltage sensing relay can be obtained I think from Sterling Power (http://www.sterling-power.com/) I would suggest installing a dash mounted monitoring LED to show you when power is being supplied if you use a VSR. Thanks Simon,It is a voltage sensing relay with the kit.Toyota tell me that there is no provision in the vehicle for an ignition controlled supply so as not to void the warranty on the car I am going to re-route the feed for the ATC in the caravan direct (through a fuse) to the supply on pin no 9.and fit the relay supplied in the car to feed pin no 10.Thanks for your help,Mike. I have an electrical issue I’m troubleshooting with my caravan. I’m 99% sure I’ve found the problem but just want to clear something up and hope you can help. I have an Ace Aristocrat 520. It has two relays in the van. One right at the front which I assume is the ‘habitation’ relay (thanks to your excellent guides by the way) and another (Exactly same relay) next to the main wiring location where the charger/mains ‘plugin’ unit is and the selection switch to switch between car/van /isolate, and the switch for the pump/heater/waterheater is. What does this relay do? I have moved your post from the ‘contact’ page to the “Understanding The Leisure Battery Charging Circuit” page as it seems more relevant. I don’t know the exact details of the electrical circuit for your caravan, but looking at a couple of others that have a similar set-up, I think the second relay will be part of the car/van/isolate switch circuit. Selecting the ‘van’ setting the relay should be off, if you select the ‘car’ setting, the relay will activate and switch the 12 volt van circuit from the leisure battery to the car. It should be fairly easy to work out, with the switch set to isolate, unplug the relay and set the switch to van… if it is the car/van relay nothing should work. Set the switch to isolate again and now plug the van into the car and set the switch to ‘car’ (with the engine off) still nothing should work. Replacing the relay and everything should work as normal. Sometime you can actually ‘feel’ the relay operating if you put your finger on top and get someone to operate the switch. Wonder if you could point me in the right direction with this issue. I have a Sterling Sprite excel and suddenly I have no lights (all 12v). tried both car setting and van. When connect by hookup I get 12v power to the pump and heating fan so power is going through the charger/transformer. Car/van settings don’t power the pump/heater fan either. I checked all fuses and there is no separate light master switch. The battery does not seem to have an inline fuse. I tested the wiring into the habitation relay on van setting and got a test bulb to light using the same colour coded wire from the transformer (brown/red) and what I suppose would be the earth wire (orange/white). So I changed the relay (unfortunately I don’t know if I have put the wire back correctly as I recorded their positions from the old relay but as I took off the last wire the body came away from the casing and it fits any way you try it (any ideas what goes where). I have presumed that the wire which was live brown/red when I tested goes to terminal 87 and the earth (orange/white) to terminal 85. The other brown/red I put on 30 and the last wire on 86. Whichever combination of positions I have used does not power the lights but one combination blows a 20amp fuse. With the caravan on EHU, you should be able to power the lights as well as the pump/heater… the caravan should be able to run all 12 volt services even without a battery directly from the supply/charger unit. Double check there isn’t a battery master fuse – usually 20 amp – somewhere. It’s most often found on the battery lead as it comes from the battery box. Just work with the switch set to ‘van’ for the moment and no vehicle connected so that the habitation relay should not be energised. The terminals numbered 86 and 85 are the coil side of the relay, put a voltage across these and the relay will switch over. So with the relay not energised contact 30 and 87a will make a circuit. With the relay energised contact 30 and 87 will make the circuit. Not sure what year your van is but those colours should be OK.
You need to get the habitation relay back correctly then continue testing. If you haven’t got one you really need a simple multimeter to check the voltages… Work from the battery and check the voltage at each point there is a connection or terminal all the way to the fuse board. Then check each fuse position to make sure there is a voltage on one side before replacing the fuse and continuing to check the voltage on each circuit. It’s difficult to describe the fault trace steps you need to take… but someone famous once said “follow the money” well I changed that to “follow the voltage” for fault finding. Really appreciate your help. Mine is a 96 430d so the wiring examples are far more complex. Still confused though as I can trace the battery leads to where it enters the wiring loom and there is no inline fuse. The brown/blue wires do appear into one of the 3 small fuse cases and this is the one I blew and replaced (20amp). In any case when no ehu connected and on van setting I got power to a brown/red (actually 2 wires on one spade) so the power gets to the relay at this point..
From what you say I have the earth (orange and white) correct. I have an old multitester needing a battery but have no idea how to use it so I’ll get googling again. Something else I noticed is that at the time we discovered we had no lights I noticed the pump light flickering and this was due to the water heater air intake having been left open after disinfecting the water system. This caused the pump to nearly empty a full barrel of water and discharge the battery. On ehu for a week did not recharge the battery but strangely when on a trickle charger it showed full in about an hour. If I find one for a 96 I’ll post it there and get back to you. Have made some progress but just a little nervous about making sure I don’t know blow the cars fuses. Checked with a meter and the only live fuse was the 20amp basically this was live at the relay. Also noticed I have live at the grey connection accessory plug. While following wiring under the wardrobe I had a fortunate discovery as trapped behind the void to the washroom was the caravans manual. And this had a diagram of the wiring which was helpful. I noticed that the lighting went through the relay but the pump and fan didn’t. This would explain why when on ehu with other 12v working the lights didn’t. I noticed on the diagram (even though the relay was not detailed) that the lighting circuit went through the relay so decided to put the live on 87a which makes a connection to 30 when the coil is not energised. Bingo I had all 12v working. I’m just concerned now incase this is the wrong way to wire it as I don’t want any problems when hooked up to the car. So to be clear the relay is now wired 85 earth, 86 trigger, live 87a. (shows voltage) This now makes a connection to 30 but are they the right way round? And diagrams of relays I have found don’t show a wire on 87a. I have been trying to find a circuit diagram for your caravan on line over the weekend without much success. One of the possible reasons it is not straight forward is the wiring standards for caravan changed in 98, so your 96 caravan would pre-date the change and I have a feeling it might have been converted over to the post 98 spec at some point. The reason you may have found diagrams with no connection to 87a is when they are used purely as an on/off switch, not as a changeover switch. Will do Simon and thanks. Suppose I’m concerned because, as I see it if I had 30 and 87a the wrong way it would still work when on battery or ehu and transformer but I don’t see how I would have a charging circuit for the caravan when hooked up and engine running. What is meant by “common” in relation to terminal 30. Does this mean that the wire from the battery/transformer (brown/red) which I find to be always live should be connected to this? That way with the other brown/red I have currently on 30 would go on 87a still making the circuit but would have the hot wire always on. Sorry If I have made this confusing. Terminal 30 is referred to as “common’ as it can either connect to terminal 87a or to terminal 87, so it is the ‘common’ connection between them… it connects to one or the other. 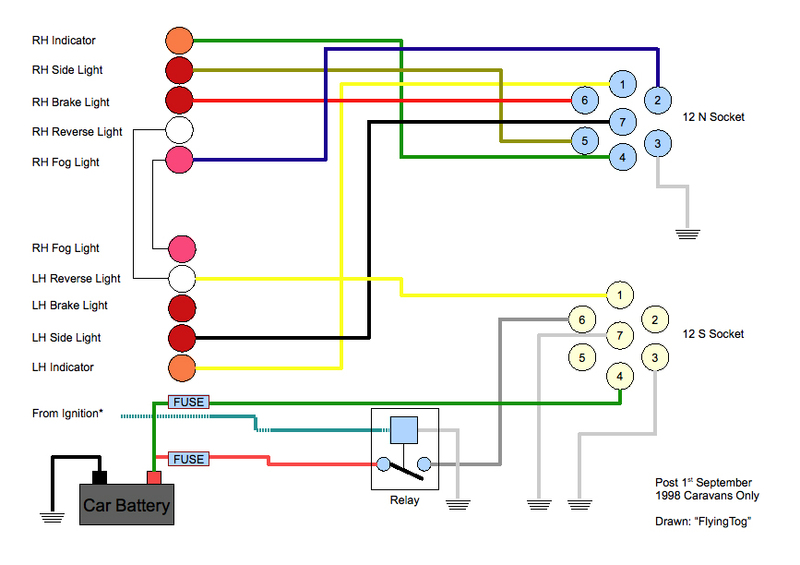 If you can get a clear copy of the wiring diagram, I should be able to draw the correct operation of the relay with the caravan on EHU and with it connected to the vehicle which hopefully will make it easier to confirm the connections. You guys were excellent at helping me get my head around the charging circuit before so I figured this would be the no1 place to come for my current issue. 1. Caravan running on local mains for everything including the water heater. 2. During the night, the site’s 16A RCBO tripped along with the caravan’s MCB for Lights, Battery Charger and Water Heater. All was reset ok and not investigated until the following morning. 3. Wife reported no hot water and panic broke out. I told her to put the kettle on. 4. No3 didn’t go down too well. 5. I checked the 5A fuse on the water heater switch. Fuse was ok and the water heater was functioning perfectly ok on gas. 6. We noticed the leisure battery wasn’t charging either. 15A blade fuse on the front of the consumer unit checked out ok. It seems that whatever caused the trip in the middle of the night may have taken out the leisure battery charger (which is incorporated in the consumer unit) and the electric water heater. Is this feasible and has anyone else experienced a similar scenario? My gut feeling is that the water heater element developed a fault which caused a surge on the circuit and took out the front end of the battery charger. Is there anything else worth checking fuse wise etc in the charger or am I looking at having to find a replacement water heater element and leisure battery charger? I’m not familiar with the Coachman setup but I’ll give it a shot! The trip that dropped out, was it an MCB for an individual circuit or was it the ELCB that switches all the 240 volt power to the caravan? If the heating element went US (direct short) it could trip the MCB for the water heating circuit… or if it went US to earth, it would trip the ELCB and possibly the site bollard as well, although the MCB and ELCB in theory ‘should’ trip first before the bollard. I would have thought it would be highly unlikely that the water heating element would have caused damage to the charger. That said, heating elements are usually fairly reliable and robust. The 15 Amp blade fuse will be for the 12 volt output of the charger…. is there a separate fuse or MCB for the 240 volt side of the charger? With two things happening at once, I’d tend to suspect something on the EHU Mains side and the charger and heater are actually OK, but just not getting mains power. ELCB’s and MCB’s have been known to fail and when you think you have reset them in fact they haven’t turned back on. Personally I’d want to check that when on EHU, the mains was coming into the van and the ELCB was working. The ELCB should have a test switch so if you can use the test switch to make sure it trips out when pressed, that will confirm that the EHU and Mains to the ELCB are working OK.
Next, I’d turn off all the MCB’s, and in turn check each one by turning it on and making sure each circuit works. I’d check each one with a multi-meter, but if you are not confident doing that, check the service it supplies… if it’s sockets, plug something in that you know works. On some caravans the battery charger is connected to the mains via a 3 pin euro-plug into the back of the unit… I believe this can come loose and sometimes causes issues when it makes intermittent contact. I don’t know if that’s the case with the Coachman setup though. Also some chargers have on the side or back have a separate fuse holder.. usually a small round black button you unscrew that contains a glass slo-blow fuse. It’s to protect an internal circuit within the charger and is not generally designed for customers to change as if it blows it means there is a problem with the charger. It’s worth checking to see if there is one though. Gut feeling is it’s mains related and I don’t think either one or the other failing would affect the other. With the bollard tripping out I think it’s a failure somewhere on the mains side and the result is the heater and charger are not working now. EDIT: I just realised the ELCB might actually be a RCD (Residual Current Device) but it can still be checked in the same way. Many thanks for your swift reply. I shall check the electrical circuits in more detail with a multi-meter etc like you say. The MCB which tripped had the mains lighting circuit on it as well, so if there was a fault with the MCB, I should have imagined none of that would be working. Unfortunately I couldn’t find a wiring diagram online that was helpful. Doing a bit of poking round t’internet there is also a fuse on the water heater control unit mounted on the heater. This would be worth a check too. I’ve been looking all morning for a electrical wiring diagram for Coachman… I can find the handbooks for the various years, but a hand book with out a wiring diagram is about as much use as a….. well your water heater! Hi Simon, concerning solar panels and charging. I have a 2014 swift challenger with factory fitted 40w solar panel fitted to roof. Will it be okay to connect a free standing solar panel directly to the caravan battery as and when I need too? You could connect directly to the battery…. but…. You need to check that the free standing solar panel has blocking diodes to stop the battery discharging in shade and the maximum wattage for a panel without a regulator is only around 10 to 20 watts. There is however something important to consider. If you connect a free standing solar panel to the battery, the existing regulator for the current panel might ‘think’ that the battery is fully charged because the free standing panel is supplying a sufficiently high voltage to the battery so it seem like the battery is charged, and the regulator will reduce it’s output, effectively leaving you with only the free standing panel charging the battery. A better way to do it would be to connect the free standing panel to the input of the existing solar panel regulator so there is only one regulator in place. I think from memory that the unit Swift fit is one supplied by Sargent Electrical and can handle solar panels up to a maximum of 120 watts. You would need to check this with Swift/Sargent. thank you for that. I have contacted Sargent and they agree with you that the regulator may sense the add on panel. However they say that the regulator/controller is 40w maximum so seems I would have to upgrade. Great job and has given me, a complete novice some understanding. I have a 2012 Bailey Unicorn….and have a redarc fitted to my ford ranger. All has been good for a year on the road until recently….12v system in the van operating fine while travelling. The caravan is definately getting power from the car. With engine off while connected the 12v system is fine. When i start the engine the 12v system remains on for about a minute then shuts off….can hear something clicking off…no 12v power to caravan. I might deduce a faulty relay? Can anyone advise? Is it OK to connect a charger to McLouis Tandy 640 G with a flat battery while the MH is connected to the mains? I assume you mean connect a battery charger to the starting (engine) battery while the MH is connected to EHU. Just check in the handbook that there isn’t an electronic split charge system linking the engine battery to the leisure battery. If there is, it should give guidance on how to proceed. To be safe though, I’d disconnect the earth from the vehicle battery before putting it on charge. You will probably need to re-enter your radios security code when you reconnect. Disconnecting the earth terminal from the starting battery and then connecting the charger will not cause any problems while on EHU. Thanks for the prompt reply. It’s not my MH and I don’t have the handbook. I’m considering buying the vehicle. The seller says that the immobiliser etc runs the battery down and he puts it on trickle charge. When I arrived to see the vehicle he had it connected to the mains with a charger connected to the vehicle battery, I’m wondering if he has damaged the electrics. The alarms on MH (and caravans) tend to draw a bit more current than ordinary vehicle manufacturers car alarms and will drain the starting battery quicker than you expect if the engine has not been started and run enough in the last couple of months. It’s not uncommon to see a small portable solar panel in the front window of MH’s just to top up the starter battery and off set the current drain of the alarm system. Or of course, having the starter battery on trickle charge. I don’t think there will be any damage to the MH electrical system. I have a suspicion that your vehicle towing electrics might be wired with a voltage sensing relay. It sounds like as soon as the vehicle battery is charged the vehicle’s ECU goes into ECO mode and drops the output voltage of the alternator to save fuel, when the voltage drops in the vehicle, the voltage sensing relay ‘thinks’ the engine is not running turning off the supply to the fridge circuit and that in turn causes the habitation relay in the caravan to turn off, disconnecting the leisure battery from the charging circuit. I’d get it confirmed that you do have a voltage sensing relay in the vehicle first. Some can be adjusted, some can’t. The correct way to wire these vehicles is by a relay controlled by the ECU. Brilliant write up of the caravan electrical circuits and charging, I’ve been getting my head around how it all works as I intend to fit a 13 pin socket to my 2006 Toyota Corolla. Could I ask, if my vehicles alternator is rated at 80 amps, would this be sufficient to use the modern wiring of having pin 9 permanent live, and the habitation relay activated from pin 10 to switch over to the charging circuit, and connecting both batteries for charging? In other words, does my alternator put out enough to charge both batteries? I had thought about fitting a VSR for this reason, but would prefer to do it how you’ve explained above. A 90 Amp alternator will be well within capacity for looking after the vehicle battery and electrics and charging a leisure battery in the caravan. Thanks Simon, and 80 amp is presumably alright too 😂. I’ve decided the best way for me to ‘trigger’ the habitation relay is to use a vsr relay to do that and power the fridge, as I can’t think of how to activate a regular relay from my cars ignition only when the engine is running? I could probably adjust it to work fairly soon after the car has started. 80 Amp will be OK. Do a search on the internet for wiring info for your car. There should be a fuse that only goes live when the engine is running, not just when the ignition is turned on. Or check with a multimeter. You can then use the output side of this to trigger a standard 30 Amp relay. A relay draws very little current so won’t affect the circuit you trigger it with. Thanks for the lead, I’ll see if I can discover a fuse or wire for that purpose. Update: I’ve found the connection at the alternator for the battery light on the instrument panel, I’ve confirmed it is 0v when the ignition is off or turned on but not started, I then started the car and read the 14v at this wire. So I’ll get a relay to be connected to this wire, I guess a fuse just before the relay might be a good idea? Sounds like you are all on the way, I would put a 3 or 5 amp fuse near the alternator to protect from accidental shorting. Hi all, I have bought an old caravan and the 12v system and supply was not up to scratch, it was a small ex-computer component testing thing, which couldn’t even power the old lighting let alone anything else. I took that out and installed a leisure battery with a smart charger and also upgraded all the florescent lighting to LED which works a treat, so bright, BUT I also installed a car stereo, which I have been fitting for years and I am also pretty good with wiring, but thus time I am at a loss as to what is happening and why. All lighting is fine until I turn on the stereo then they blink when it turns on and the blinking gets worse as the volume is turned up, the more the bass etc the worse the blinking in time with the music. I have checked all connections and all is fine. The water heater switch also works off the 12v and when that is switched on they blink but not too much. I must say that I have grabbed the power for the stereo from the lighting system, which most people seem to do and do not have this issue! Any idea’s anyone? At a quick guess the wiring is too thin. A car stereo amp pulls more current on the bass notes and as the current increases, the voltage drop on thin cable will be noticeable as flickering. Second – install a voltage regulator on the lighting circuit. Not all LED lights have protection from voltage fluctuations and as a battery charger can output over 14 volts it can cause cheap LED lights that don’t have a voltage regulator built in to fail. Hi Simon, many thanks for the input. I have sorted this now by simply wiring the radio direct to the battery, it has been spliced into the light circuitry which as you say is not meant for heavy drain items! Works a treat now, albeit with more agro than I wanted, but still it is in and a neat job done! Ok so all the items turned up and I’ve fitted and wired it all up, using your diagram to test the 13 pin plug, everything checks out, just need to try it on the caravan soon. One thing having a permanent live pin (9), slightly puts me on edge, I know until it’s earthed it’s not really doing anything and it has a 15 amp fuse close to the car battery in case, but still am I worrying over nothing? After 5 years of having a 13 pin socket fitted to two vehicles, I have never had an issue with a permanently live pin. I did keep thinking about it in the early days but kind of forgot about it after a while. I did make up a lead that allows me to plug in my smart charger for winter battery maintenance and it doubles as a connection for a 12 volt LED flood light. That’s great, just need to forget about it lol. Good idea about other users for that connection! It’s Gareth, I’ve now got my own blog hence the new name! Just wanted to let you know, the 13 pin socket all works on the caravan, and as I have a Freedom caravan, it didn’t have a habitation relay, in fact it doesn’t come with a leisure battery as standard, I added one and the fridge and charging circuits all work too. One strange thing I discovered was that pin 9 & 10 had been connected together within the caravan, I have no idea why it would be set up like that, but using your write up, I have successfully separated the two circuits, and fitted the relay, so all is good, I’ve written a blog about it to hopefully help other Freedom owners. So thanks for all your time and research and helpful information and replies that have helped me. My caravan control panel is showing 13.6 whilst plugged into the mains, is this normal? Sorry for the delay in replying…. I’ve done a bit of checking and if you have a standard 13 pin OEM electrical tow bar package fitted you will not have any problems charging the leisure battery in the caravan. The camper van leisure battery will charge via the existing electrical installation and the tow bar electrics will be wired in the camper van so that the caravan is charged. I would suggest going for a quality electrical system such as one from Westfalia. You helped me out before on my previous tow car regarding the fitting of a relay in the car, using the alternator light to trigger it. That fitment went well until I decided to go and change the car! I managed to remove the relay and fuses I’d fitted and have tried to do the same on a 2008 Honda CRV. What’s happening though is that when the relay is getting power nothing happens, no click no movement of the contacts (I took the cover off to check). I tested it direct to the battery and it works fine. So when I tried it through the new wiring again, I tested the voltage and gave it a direct earth to the battery, and it’s pulling the volts down from over 13 to just over one volt, but not energising, I then realised the battery (alternator) light is on, and when I disconnect the relay with the engine still running the battery light goes out. So I conclude that the power is going so low as to allow the battery light to come on, but I don’t understand why the relay won’t work? Further to my previous comment, I’ve been thinking about the problem, and it’s occurred to me that surely the battery light can only come on being earthed, and yet I measured a voltage as I explained. So now I’m wondering if I’ve inadvertently hooked into the exciter wire for the alternator not the charge light, and the reason battery light came on was because I’d interrupted the alternators ability to make power? I’ve now come across the idea that if the car is CAN bus, then there could be a signal sent to the regulator which is pulled to earth if a problem occurs, telling the ecu to put the charge light on. All my research tells me my CV R shouldn’t have this but it would explain my symptoms. If I find that the case, is it possible to use a bypass relay to take that signal to then output a usable 12v which I can connect to the original relay I wanted to use? Yep I don’t see why not… might need a transistor to use as a switch to operate the relay… or a blocking diode to catch the back emf across the relay coil. I found this article while searching for information on how to charge a deep cycle/leisure battery on a car transporter trailer, the battery being used to power an electric winch. Obviously most of the information about habilitation relays and so on isn’t relevant to my situation but it would seem that if my 12S socket is correctly wired to the post 1998 specification, I can simply connect pin 4 to the trailer battery positive terminal and pin 3 to the negative (earth) terminal of the battery and let the alternator of the tow car sort out the charging levels. Is that correct? If so, what is the effect of pin 4 being permanently live when the tow car is connected but not running; and if not, can you explain what I should do? I wrote it a few years ago to help out a German chap who towed his classic sportswear on a twin axle car trailer behind an American RV. If you look at the electrical drawing it should give you an idea of how to configure a set up for a winch battery. You do however need to take into account that feed back from the winch battery to the tow vehicle battery must be stopped when starting the tow vehicle. Many thanks, Simon, for such a speedy reply. However, this seems to be overkill for what I need as I would only be using one battery. What I struggle to understand is how in a caravan the leisure battery is apparently charged via the always live pin 4 with no leak back to the tow car. But perhaps that is achieved by the circuitry in the caravan? Would some sort of voltage sensing relay achieve what I need? In a caravan there is a relay called a habitation relay. This is triggered by the fridge circuit becoming live…. which only happens when the tow vehicle engine is running. Once the habitation relay is triggered this then allows the connection from the tow vehicle to the leisure battery in the caravan to connect. A voltage sensing relay is not the way forward as most cannot protect against the leisure battery staying to supply starting current if the vehicle starter battery is low. A simple 30 amp automotive relay can be used. Thanks again! So a 30 amp relay to connect pin 4 to the tow car’s electrics, with the relay triggered by the fridge circuit on pin 6? Or could I just use pin 6 to charge the battery since the pre 1998 12S wiring used an ignition controlled supply for battery charging? You need to stick to the standard convention of wiring pin-out’s and how a caravan would handle it. Main reason, if by chance you needed to tow the trailer with a replacement vehicle, you would want to know it worked no matter what and would not harm the new vehicle. Additionally, you don’t want to modify the existing tow vehicle so it is non standard… which could become problematical with current or future vehicle testing procedures. Vehicles over the last few years have become very clever… A few years ago Land Rover owners first started noticing issues when Land Rover programmed their alternators to turn off when the vehicle battery was fully charged and effectively took away the vehicles ability to charge leisure batteries. In my Amarok, when I brake the alternator provides a huge amount of engine braking by dumping over 2Kw of energy into the AGM starting battery, therefore this battery can only be ever charged up to 80% capacity… limited and controlled by the vehicle’s ECU.This in turn means that technically I can only ever charge my leisure battery to 80% capacity. There are products that overcome this limitation on the market. It’s therefore imperative you follow the same ‘rules’ that the caravan designers have to make sure the electrics on the trailer are compliant. In Europe/UK by law any electrical devices on a trailer (and this includes your winch) MUST be disconnected from the tow vehicle to ensure that they cannot interfere with the vehicles electrical or safety systems when being towed. The exception being the trailer road lights, obviously. That is why the habitation relay is there… to disconnect the caravan from the vehicle battery and leisure battery. In the caravan context it really is a change over switch… changing over the leisure battery connection from the tow vehicle charging circuit to the caravan services circuit. In your case the winch isolation switch will perform this isolation from the leisure battery and the habitation relay will simply connect to the vehicle charging circuit when it receives a voltage from the fridge circuit once the engine is running. Liability wise I can’t tell you exactly how to connect it up… I can only point you in the direction of articles I’ve written as explanations of how things work. Ah, so the 30 amp relay would go on the trailer and be triggered by the fridge circuit on pin 6 to connect the battery to pin 4? Although the same result could presumably be achieved by wiring the trailer so that pin 6 did the charging rather than pin 4. That wouldn’t preclude hooking up to a different tow car. But I’ll read the articles you’ve linked to as I mentioned I’m sure they’ll be helpful. Only use 4 for charging and 6 for triggering the habitation relay. Simple reason, some ECU’s current limit 6 to about 12 to 14 amps as that is all a fridge generally draws, where 4 is not usually limited (except by voltage drop so use 4mm2 cable as a minimum). Also a lot of vehicles can turn off 6 to reduce the electrical load on the vehicle… say in winter when you first start… put the lights on, turn the rear screen de-mist on, turn the screen blower on full. To make sure the vehicle battery is recharged ready for the next engine start, the vehicle ‘dumps’ excess load and this will be the fridge and leisure battery charging and reinstates them when the electrical load in the vehicle reduces or the starting battery reaches a pre-determined charge level. Keeping to the standard for 4 and 6 will hopefully future proof your installation. There is some chatter going on at the moment saying that any trailer over 750Kg capacity (i.e. a braked trailer) will be required to have something similar to an MOT each year. Apparently this is being driven by a few countries in Europe that have separate licensing for trailers and want to have a safety check as part of that. So again keeping to convention might just pay off in a few years time. This is all very helpful – thank you. My trailer is for a vintage – 1930s – car and my understanding of car electrics hasn’t had to extend much beyond three brush dynamos and cut outs (no regulators!). So the idea that the tow car can potentially sense what’s connected to it and adjust its alternator output accordingly is a novel one, to say the least! But I’m nearly there. If pin 6 is the trigger for the relay to connect the leisure battery to pin 4, and thus to the tow car’s battery for charging, is pin 6 live as soon as the ignition is switched on or is it somehow constrained until the engine is running? If not constrained, wouldn’t cranking the tow car engine draw on the leisure battery via pin 4 with potentially disasterous results? Pin 6 on the vehicle was originally controlled by the ignition light… I.e. when the alternator (or dynamo!) was producing enough voltage it would extinguish the old ‘ign’ light. Now pin 6 is controlled by the vehicle’s ECU. Pin 6 will not have any voltage on it until the engine is running. This is perfect! Thank you so much for taking the trouble to answer my very basic questions. I now feel I can talk to the towbar fitter next week in the knowledge that I know what I needs to be done to give me the trailer battery charging that I’ll need. It is a simple matter then to convert the trailer to a 13 pin plug that contains all the correct connections for your charging circuit. I’d thought of that but the trailer (with a 12N plug) is in England and I am going over from Belfast to collect it. I’ll then need to add in the wiring for the battery charging once I get it home and it seemed easier to do that via a separate harness and a 12S plug and socket. If I fit a 13 pin socket on the car I’ll need an adapter to collect the trailer and then will have to convert the trailer to 13 pin and add the extra charging harness into the plug as well. Using the two 7 pin sockets and plugs seems easiest. Or a cheap adaptor that plugs into the 13 pin socket and allows a 12N to plug in… just a thought. True. And I could then get the towbar guys to wire up a 13 pin plug on the trailer and add on a small loom for pins 9, 10, 11 and 13. When I draw out the wiring I’d need for the trailer it’s just a relay activated by the fridge circuit which switches in the battery charging circuit. To keep it simple, is there any technical/electrical reason why I couldn’t just use the fridge circuit to charge the battery and skip the relay and the additional pair of wires? No reason at all…. but you stand a good chance of screwing the vehicle electrics. The fridge circuit is controlled by the vehicle and is not designed to be back fed 12 volts which you will be doing. If it dosen’t fry the vehicle electrics, maybe the vehicle will drain the leisure battery. I have no idea what will happen as its not something I’d countenance and have never considered. The habitation relay is put there for a reason and it is controlled by the vehicle in the way it is for a reason. OK, I understand what you mean about the fridge circuit not being designed to be connected to another 12v supply. Presumably the battery charge circuit is designed to cope with this. The battery charging circuit has protection for the vehicle. The fridge circuit may or may not have protection. Both will certainly have 15 or 20 amp fuses. On modern vehicles it is probably sold state switching within the electronics command module or within the OEM towing electrics add on module. Long gone are the days of just adding wires to the tail lights and running a wire up front to the battery. As an aside, The owner of a tow bar fitting company related a story late last year to me about one of the ‘apprentices’ forgetting to change his multimeter from current setting to voltage setting and he accidentally probed across the fridge circuit and battery charging circuit on a new vehicle that was having a tow bar fitted. The result was the owner was without his vehicle for three weeks and it cost over £2600 for a new ECU, master electronics control module and sensor module. In addition the vehicle had to be transported back to the main dealer to have the software re-uploaded. I’ve not mentioned the make as these vehicles are particularly sensitive to their electronics being played about with. PS… don’t forget that your tow vehicle if less 6 or 7 years old will probably require a main dealer software re-program if your tow bar fitter can’t do it. Thankfully my tow car is a 10 year old Volvo V50 and as far as I’ve been able to determine no software update is required. The guys who are fitting the tow bar and electrics are very experienced and reputable so I’ve no concerns that they’ll get it wrong. As long as they wire the socket fully, that will allow me to get the trailer home and then they can make up the trailer charging loom with the relay! I had to get a Volvo software update once the cable harness was installed but I find that pin 10 (the ‘fridge’ circuit) is live once the ignition is on and doesn’t get cut out when cranking the engine. The effect of this would seem to be that with a flat car battery, attempting to start the car would draw on the trailer battery since the fridge circuit would be live and thus the charging circuit would also be ‘live’. Hmm…. sounds like something is not right. You are right in your conclusion. The first thing to check is the voltage on pin 10… then with the voltmeter still attached get someone to start the car.. or turn it over. You might find that before the starter relay engages, the vehicle disconnects the supply to pin 10 therefore disconnecting the leisure battery from the charging circuit. Some early Land Rover Discovery OEM units had this “feature”. Also check if Pin 10 is live with the key out of the ignition… if it is, this means that the fridge will be drawing current from the vehicle even when parked up and key out. Quick way to drain the vehicle battery. I’m not too familiar with the Volvo setup… I’ll make an assumption that it is either a Volvo product or an OEM version produced by someone like Wesfalia. If it’s Volvo, check back with them, if it’s an OEM one, check to make sure the Volvo normal towing software upgrade is suitable. It might be that the OEM manufacturer has its own settings for the upgrade. Let me know how you get on… It may be useful to other Volvo drivers. Just re-read your comment… missed the point you had made about the circuit not cutting out when cranking. This is def not right. After doing a bit of digging round and checking Volvo specs, you need to take this back to the installer as something is wired or programmed wrong. The cable harness on the car is a Volvo one, together with what they call a ‘trailer module’ which handles the signalling to the 13 pin socket. The software update was done by my local Volvo dealer whom I know well so I’m content that they did their bit OK. In fact I can’t see that it could be done wrong as the software would either install or it wouldn’t. But, although the car has a 13 pin socket, the trailer only has a single 12N socket at the moment so I’ve been using a 13 to 12N and 12S adapter lead and testing things with the 12N plug from the trailer in the 12N socket on the adapter. I think I need to follow up on a couple of different things. First, I will ask Volvo how the trailer wiring is supposed to work. I’ll also remove the interior trim from the back of the car and check that the leads from the cable harness are plugged into the right sockets in the trailer module. There are nine wires from the harness plugged into the module listed as reversing lamps, ground, power supply, right parking (side) lamp, left (side) parking lamp, right indicator lamp, left indicator lamp, brake lamp, fog lights. The module has provision for twelve wires to connect which suggests that the ‘fridge’ circuit may be missing, or at least not constrained to only operating when the engine is running and simply ignition controlled. There are three unused sockets on the module which suggest that in other models it may have the full specification of wiring. There are also two other plugs with two terminals each that plug into the module but it’s not clear what they do. I’ll also have a chat with the guys who did the install as they are very experienced and might have some idea what has happened. More research needed but clearly as it is it can’t be used to charge the battery! A bit of a different question for you. I am purchasing a 2018 bailey unicorn cadiz, and have to modify my towcar to provide the permanent and ignition switched power. Now the tricky bit is that my tow car is a 24volt Nissan safari 4wd. This is an old school 1990 model, no smart alternators or computer to deal with. I already have an even charger fitted to equalise the charge across the two 12v, series wired, safari batteries, and this allows me to take one 12volts permanent feed off to supply the caravan. I intend to use this feed to supply pin 9 the 12v permanent supply for the ATC braking. Now I am wondering how to supply the 15 amps or so of power to Pin 10, the ignition switched feed to the fridge and battery charger. I can buy a 24volt DC/DC 30amp converter which I could mount in the boot to supply 13.8 volts to the pin 10. I assume that I would use a relay to switch the power on to this unit. With a constant 13.8volts or so depending on cabling losses I wonder how this would affect the caravan battery charging, or would the battery even charge at all. If you can think of any better ideas or improvements I would be grateful. Pin 9 is the 12 volt permanent supply and should provide power for both Alko ATC and the Leisure Battery charging circuit. Pin 10 (ignition switched) provides power for the fridge. This circuit also operates the habitation relay which effectively disconnects the leisure battery from he caravan and connects it to the charging circuit. Pin 9 supplies the leisure battery AND Alko ATC so that in the event of the voltage drop being significant from the vehicle it can draw power from the leisure battery as well. So in reality all you need is a DC to DC, 24 to 12 supply for the fridge… about 15 Amps. If I was wiring this set up, rather than run a 12 volt circuit from one of your vehicle batteries, I’d put two smaller 24 to 12 volt units in the rear of the vehicle (keeping everything in the vehicle 24 volt), one for each of the circuits (pin9 and pin 10) this will reduce the voltage drop between the vehicle and caravan. I’d put an ignition controlled relay on the 24 volt side of the unit supplying pin 10. Now… you could use one 24 to 12 – 30Amp unit to supply both circuits. Split the 12 volt output, so one side provides power to Pin 9 and the other supplies pin 10 via an ignition controlled relay. If you can mount the 24 to12 unit(s) in the rear of the vehicle and keep the 12 volt cabling to the tow socket to a minimum using 4mm cable, the voltage drop will be minimised and you should be able to charge the leisure battery. An upgrade for the future might be to put a 12 volt DC to DC leisure battery charger in the caravan (that’s what I have done) to provide multistage charging to the leisure battery. However you configure it you need to keep in mind that if you plug any other trailer/caravan in to the vehicle it should work and conversely you want to be able to plug your caravan into any tow vehicle and work. I forgot to say in my first post that your blog is the best explanation of the Leisure battery and associated circuitry that I have found, thanks very much. I have taken on board your comments, which reflect where I was heading, I just needed some expert opinion. I have now got clear how the caravan battery gets its power. One final question, regarding the power draw through pin 9, when the caravan is connected up and the tug motor running. 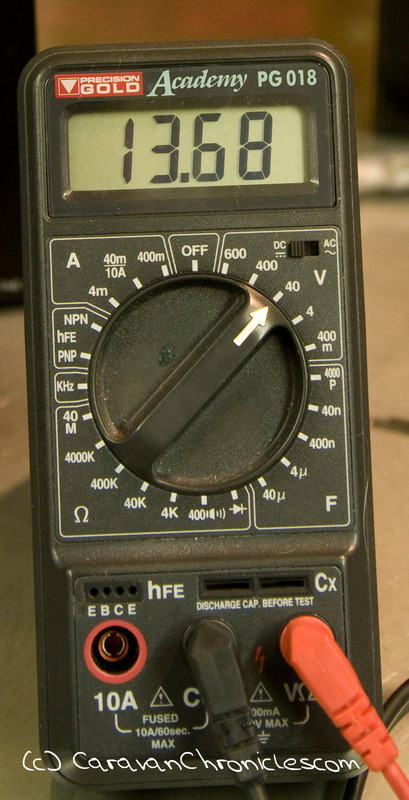 The ALKO ATC unit draws just over 14amps when it is required to operate, very little otherwise, and with the battery connected through pin 9 as well there could be quite a draw there as well. So I am wondering what amperage converter I should buy for this load, 14 amps plus ? batt draw, and what could the potential max load through this pin 9 be? In standby mode the Alko ATC draws very little current, however when activated as it is powered by the circuit that supplies the leisure battery charging, current is drawn directly from the circuit so in effect both the vehicle and the leisure battery supply the current.